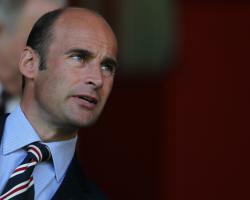 Press Association Sport understands the 69-year-old is acting as an unofficial adviser as chief executive Martin Bain, with whom he worked during his time in charge at Rangers, draws up a shortlist of potential candidates following Moyes' resignation on Monday evening. The Black Cats are in no rush to make an appointment after going through no fewer than eight permanent managers since Roy Keane parted company with the club in December 2008, and four since Martin O'Neill was shown the door in March 2013. Smith's role could point to exactly where the club may look for the new man, with Aberdeen's Derek McInnes' name having been mentioned in dispatches after he guided the Dons to a second-place finish behind runaway champions Celtic. The bookmakers are divided in their assessment of the situation, with former Black Cats striker Kevin Phillips, currently on the staff at Derby, and ex-Leicester manager Nigel Pearson among the early favourites, while one-time Newcastle manager Alan Pardew's potential candidacy has raised eyebrows. Sources close to Aitor Karanka, who left Middlesbrough in March, and former Boro and Magpies boss Steve McClaren have played down speculation surrounding them, while Garry Monk continues to figure prominently in the betting with his current deal at Leeds due to expire next month and no extension yet agreed. However, as Bain draws up the list he will then present to owner Ellis Short, he will do so knowing the job he eventually puts before his chosen candidate could be a difficult one to sell. Sunderland's financial situation is bleak - their last annual figures showed a loss after tax of Â£33million and a net debt of Â£110.4million - and relegation from the Premier League will drastically reduce revenue. In addition, they still owe significant amounts in instalments for transfer fees they have committed in the recent past, some for players no longer at the club. Moyes was made aware of the full extent of the problems only after he had taken the job and his dismay at what was available for him to spend in January only grew when it emerged that any summer rebuild would have to be conducted on an extremely limited budget even if the club did cash in on the likes of Jordan Pickford, Lamine Kone and Wahbi Khazri. A wage bill of Â£83.8million, which accounted for 77.6 percent of the club's turnover in the year to July 31, 2016, will be slashed by 40 per cent due to relegation reduction clauses in the contracts of most of the players who stay, while Jermain Defoe's seemingly imminent departure to Bournemouth will raise no cash, but save around Â£4million a year in salary. But with Short's hopes of selling the club having so far proved in vain and his willingness to throw more good money after bad exhausted, the vacancy at the Stadium of Life is perhaps not currently as attractive as it might have been in the recent past. There is a huge rebuilding job to be done on Wearside, and former defender Anton Ferdinand is calling on the club to give the fans a manager and a team they deserve. He told talkSPORT: "Up there, people go to work just so they can go to the game - that's how passionate it is up there, and the team didn't reflect that last year. "The team I was in up there was full of players who knew the Premier League and who played with determination and knew that you had to compete and run and work hard for the shirt before the quality on the ball came into play. They deserve someone in the technical area who shares their passion, and they deserve players up there who share their passion too."